Over the weekend we made these pancakes from 101 cookbooks a favorite go-to site for yummy healthy recipes and this recipe sparred with our other favorite healthy pancake recipe and came out victorious. They were fluffy, tasty, and somewhat healthy as far as pancakes go. If you like blueberries, the syrup is delicious too! The secret I think is the white whole wheat flour. I love that stuff, because you get all of the nutritional benefits yet it isn't as heavy as the normal stuff. Speaking of flour, other ones I like are whole wheat pastry flour, and buckwheat flour and I haven't tried it yet, but I have some whole wheat spelt flour in my pantry. I've been meaning to get into wheat flours, as I'm slowly trying (keyword: trying!) to cut refined and processed foods out of my diet. Which is difficult since I'm kind of in love with cakes, cookies, pies, etc. Glad to hear this was delicious! It makes me excited for a healthier approach. Oh my goodness, my stomach is asking me for some of that asap. oh my...I love your straw! We've recently gone down the almond flour and coconut flour paths and love it! I have an awesome pancake recipe that uses these flours and they taste so good, are marvelous for you and aren't heavy like wheat flours. Highly recommend almond flour and coconut flour! I've been trying to cut down/out the white stuff too. These make nice light pancakes, and I typically serve with a similar blueberry sauce. This recipe looks good too, though, and I'll have to spend more time trying out the different flours. Wow, those pancakes look delicious..The blueberry syrup...yummmm! I really like Quinoa Flour. It can have a bit of an after taste so it must be used with something that has an overpowering flavor (I like to make pumpkin muffins with quinoa flour and quinoa flakes--a great gluten free option). I really like Spelt as well. I just posted a recipe for some delicious seed waffles. Amazing! I also made pancakes this weekend... This recipe is quite similar to the ones I made and they were very tasty! I make a crepe-type version of a pancake & recently used half spelt & half whole wheat flour with a dollop of Balkan-style yogurt in the mix & they were delicious! Like Jack Johnson, I love banana pancakes!! You just place the sliced banana in the pancake before you are ready to flip them. And the banana gets slightly caramelized. I want to experiment with a ricotta topping.. maybe with sliced almonds and coconut. hello! 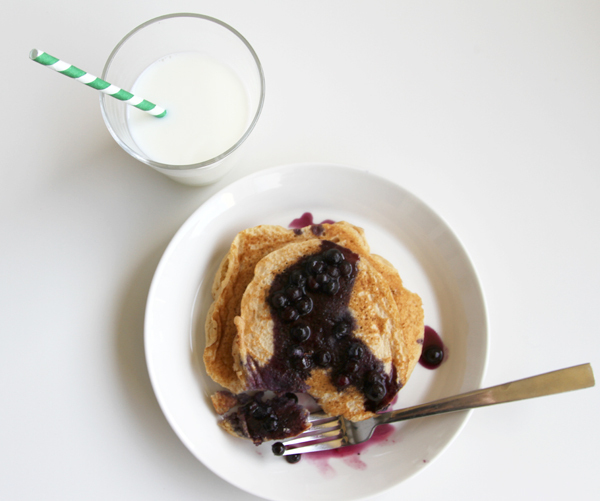 We love spelt flour pancakes. When we run out of spelt, we sometimes use the summer wheat or regular unbleached wheat and add Teff. Teff is a flour from Eritrea and Ethiopia and packs a wonderful nutritional punch - tastes great with a few tablespoons to your regular pancake recipe.